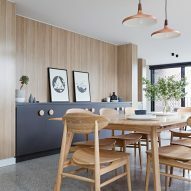 Inbetween Architecture has renovated and extended a dated brown-brick property in Melbourne's Doncaster suburb to improve the quality of its living spaces and capture views of nearby Ruffey Lake. 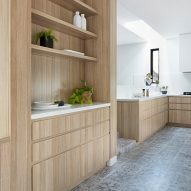 The late 20th-century house suffered from an over-compartmentalised plan that left a number of rooms redundant and others without adequate natural light. 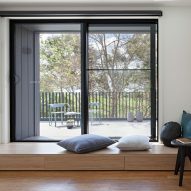 Local studio Inbetween Architecture was commissioned to transform property into a more suitable home for a family of five, opening up previously neglected views of the adjacent Ruffey Lake Park from which the project takes its name, Ruffey Lake House. 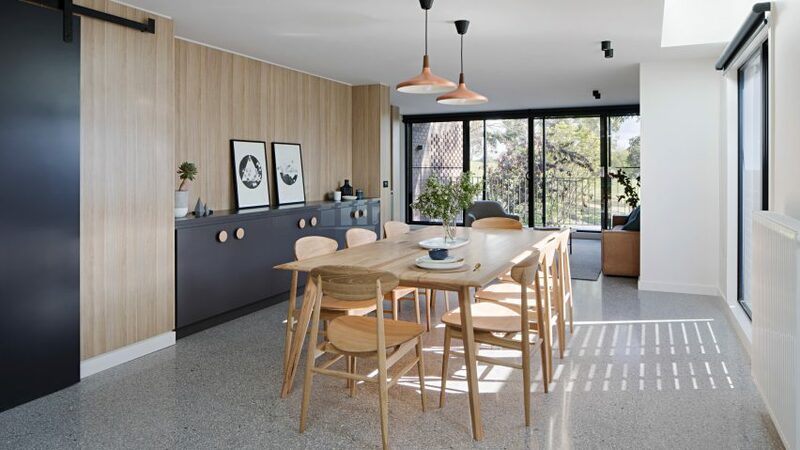 "What do you do when a client comes to you with a site overlooking the beautiful Ruffey Lake Park, and a big, dark, compartmentalised and terribly dated house, that they want to keep?" said studio founder John Liu. 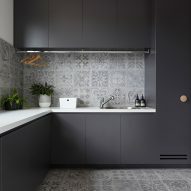 "The owners wanted to modernise the house and bring it into the 21st century. They wanted more natural light, a brighter interior, flexible spaces and the ability to see the park reserve across the street." After choosing to retain a basement garage, the architects rebuilt and extended both the ground and first floors of the house. Bricks and pieces of steel salvaged from the demolition have been integrated into the structure wherever possible. Parts of the brickwork is laid in a perforated pattern to break up the mass of the building, and paired with dark brown composite cladding that complements the tone of the brick. The cladding and the aluminium frames that surround the large windows are designed to termite-proof the house. 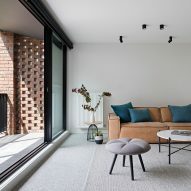 "The insertion of hit-and-miss brickwork blurs the distinction between interior and exterior spaces and provides a surprise lightness to the otherwise solid forms," said the studio. "The external form was re-imaged as a series of solid and transparent layers stacking over the existing brick structure. 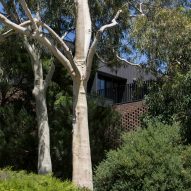 We wanted the house to blend into the surrounding." 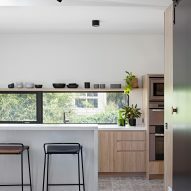 Inside, the previously dark and cramped rooms of the home are now positioned at its periphery, maximising their exposure to natural light and providing views to the garden or out onto the street. The updated ground floor features an open-plan kitchen, living and dining room, alongside a music and TV room. 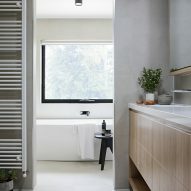 These are arranged around a timber-clad service core containing a bathroom and storage. 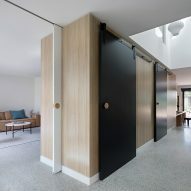 Sliding doors are incorporated throughout the open-plan space, and allow the music and TV room to be sectioned off from the other areas to contain the noise. During the renovation, the master bedroom was moved to the new first floor, which also made space for a guest bedroom on the ground floor. A light-filled library is set on the ground floor, and casual reading spots are dotted throughout the house, with a large bookshelf lining one side of the central staircase. A series of voids and skylights were also introduced to bring light into the core of the building. 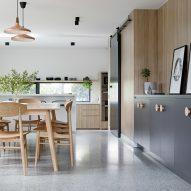 "The ground floor was rebuilt and extended to deliver abundant natural light, highlight stunning views, and provide a seamless connection between kitchen, dining and living spaces – essential to modern family life," said the architects. The first floor now houses four spacious bedrooms, two of which are ensuite. 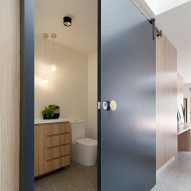 They are each connected to a communal landing that leads out onto a new private terrace, allowing the family to enjoy views of the nearby nature reserve. Inbetween Architecture incorporated a number of sustainable design element into the project, including windows positioned for optimum solar gain and a rainwater harvesting system. Annie Ritz and Daniel Rabin recently completed a similar project in Los Angeles, renovating a poorly sub-divided 20th-century home to maximise space and natural light.